Ignore any damage done (except status conditions) by your opponents defending fire type Pokemon. Additionally every turn you may flip a coin, if heads Prevent any damage done to rapidash for that turn. 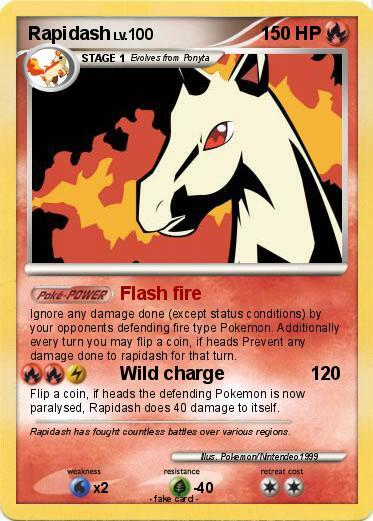 Flip a coin, if heads the defending Pokemon is now paralysed, Rapidash does 40 damage to itself. Comments : Rapidash has fought countless battles over various regions.